Nearly 6,000 automotive tech students in Michigan will be among the first beneficiaries of the state’s Marshall Plan for Talent grants. 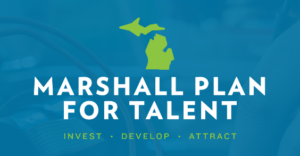 The Marshall Plan was created by former Governor Snyder to address talent gap issues and develop innovative solutions to close the gap. The Middle Michigan Professional Trades Consortium, a group of partners from industry, education and community organizations, was awarded more than $1.2 million dollars from the Marshall Plan to improve two automotive training labs. The labs will be used by Clare and Gladwin County Career & Technical Education, and Mid Michigan College students. The grant will accomplish several objectives in CTE Automotive & Diesel Technology labs in Clare and Gladwin counties, assisting with the purchase of modern equipment and technology, as well as hiring Career Navigators to assist students and establishing an educator externship program. Through a partnership with Mid Michigan College, students in the automotive program will have the opportunity to earn more industry-recognized certifications while still in high school. With the current shortage of automotive technicians, this is a significant program that will benefit dealerships, repair facilities and our customers. Please read more here.